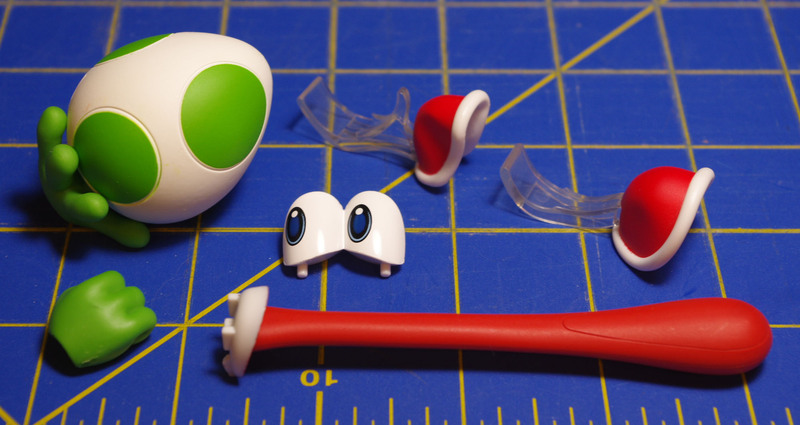 So, when I order things from overseas, meaning, from AmiAmi, I like to order several items, to help cut down on the bite of the pricey shipping. So when I had a preorder come up, I threw on a second figure for good measure. I’ve been wanting to get my own Revoltech Woody for a while, for “dumb meme reasons”, specifically, the Woody with the “creepy face”. He’s a pretty fun and funny figure, and he was recently re-released. For my add on figure, we have Figuarts Ash Ketchum, from Pokemon. I wanted to get Team Rocket, but I couldn’t swing that one this round, so I went with Ash for now. He’s also pretty nice, and will be fun to use with the few other Pokemon figures I have, which is a collection of little PVC Pokemon I’ve picked up here and there as well as the domestic release of Dawn. 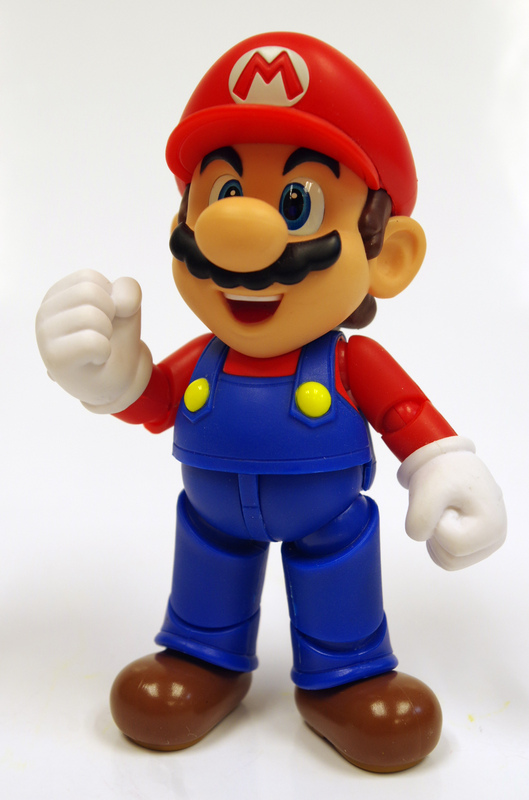 It’s Mario, it’s pretty good in all the ways Mario is good. 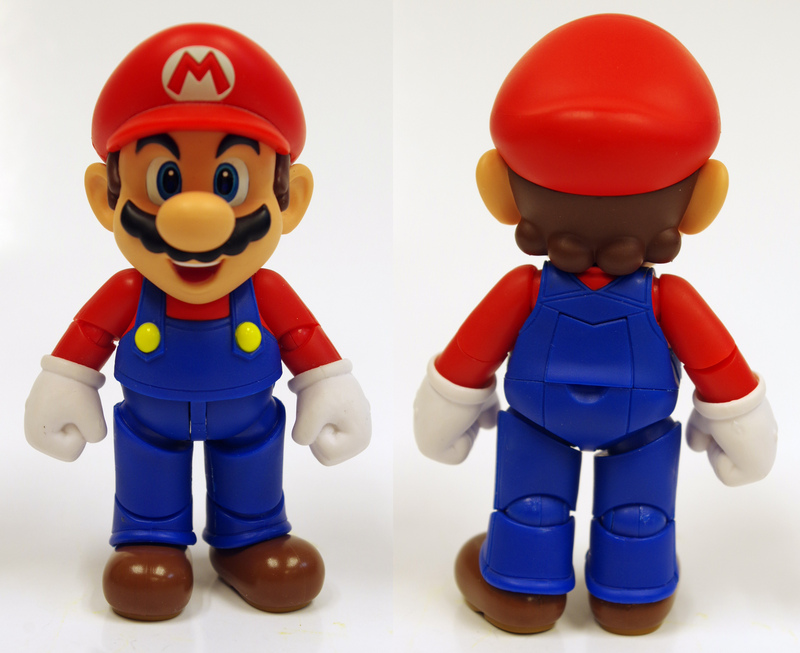 If there’s one consistency in Nintendo’s world, it’s Mario. I’m not even going to attempt to figure out just how many Super Mario Brothers titles there have been, let’s keep it at “a lot”. 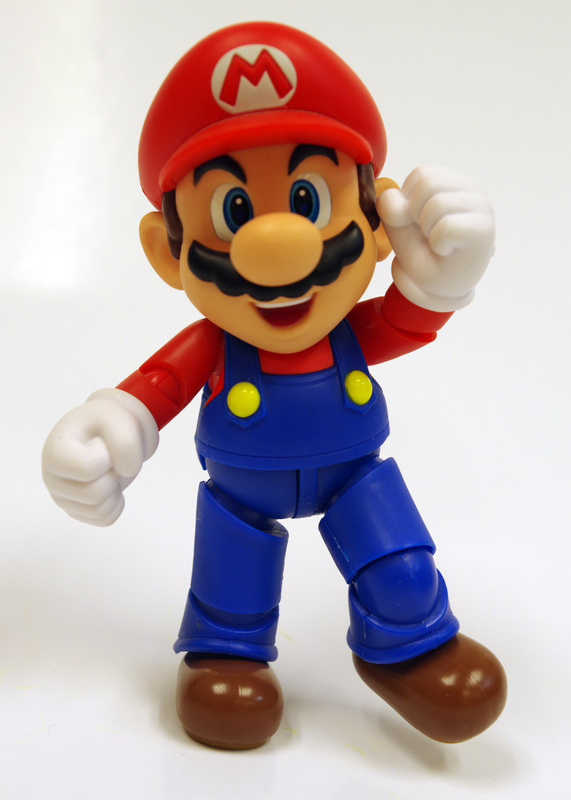 A few years back for the original Nintendo DS, we got the first New Super Mario Brothers, a sort of, return to roots restart of the Super Mario Brothers franchise. There have also been a few New SMB titles on the Wii and WiiU as well. 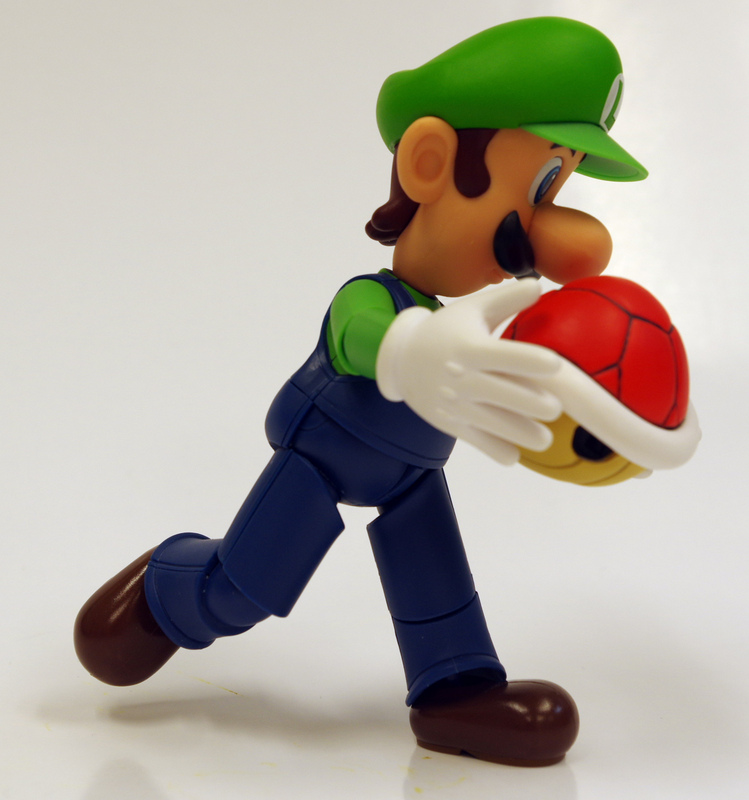 New Super Mario Brothers 2 comes to the Nintendo 3DS. It’s not a remake of any previous title, despite the name, which can be a bit confusing, given how much Nintendo rereleases it’s old SMB titles. 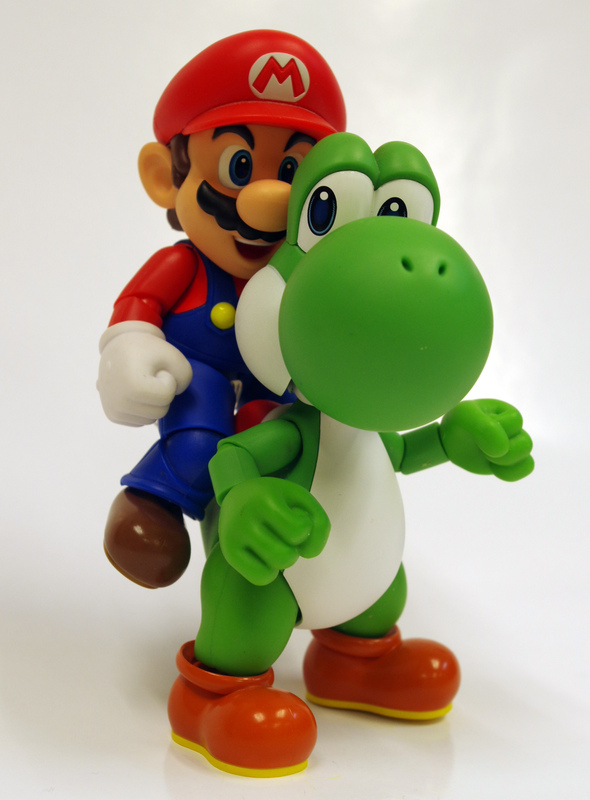 I didn’t expect it to be a remake but they seem to have taken the same idea with the Yoshi’s Story series, there is a New Yoshi’s Story, that apparently isn’t a remake of the original as I had thought it might be. Though not a remake, there isn’t a whole ton here that’s super original. While the more old school Super Mario Brothers titles would get newer graphics and power ups and music, this game looks and feels very much like it’s predecessors, especially New Super Mario Brothers for the DS. There aren’t even really any super original power ups in this title, the primary two being the Fire Flower and the Raccoon Leaf. I really like the return of the Leaf, SMB 3 is one of my favorite titles in the series. 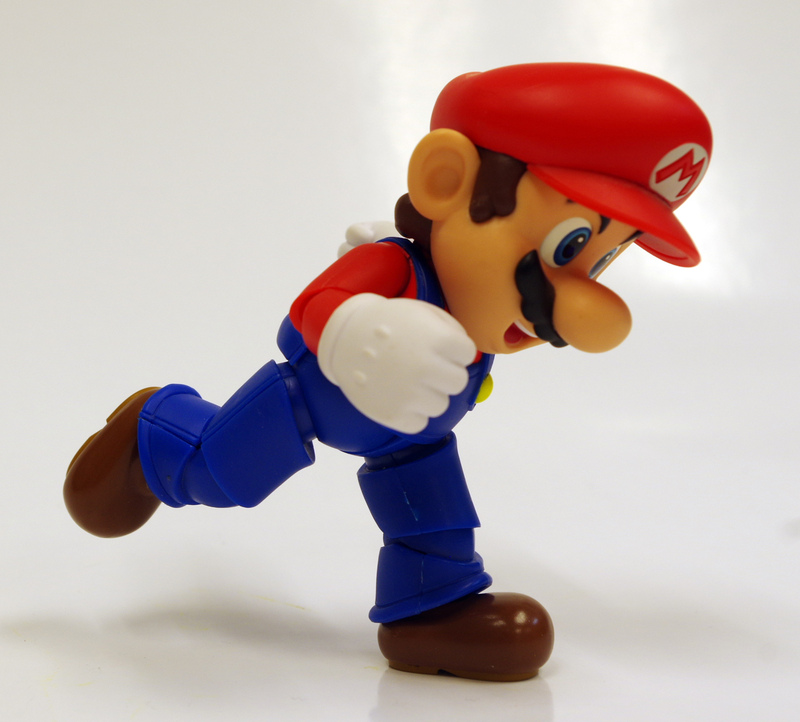 Of all of the ways Mario has been able to fly over the years I always felt like Raccoon Mario was a good balance between functionality and being too over powered like say, the Cape. If you fail a level too many times you will be rewarded with the chance to use a White Raccoon Leaf, which gives you unlimited invincibility as well as (normal) flight power. This isn’t always the best choice though hen trying to collect the Star Coins necessarily though, as some coins require you to perform tricky bounce maneuvers across enemies, with the White Raccoon power, you’ll simply push right through the enemies. Also, while completing the stage with the White Raccoon lets you proceed, the stage will remain red and incomplete for actual completion percentage. The real addition to the gameplay here is the coin accumulation. In addition to score, you have a counter for how many total coins you have collected throughout the game. The only real change that occurs as you collect coins however is that the pile of coins on the title screen will gradually grow larger. This feature is similar to how Wario Land worked. It might have been a nice twist to the classic formula for Wario or maybe the genie from Wario Land to show up, giving this coin total purpose, but sadly, it’s just the slightly tired 8-9 worlds with Koopa bosses. 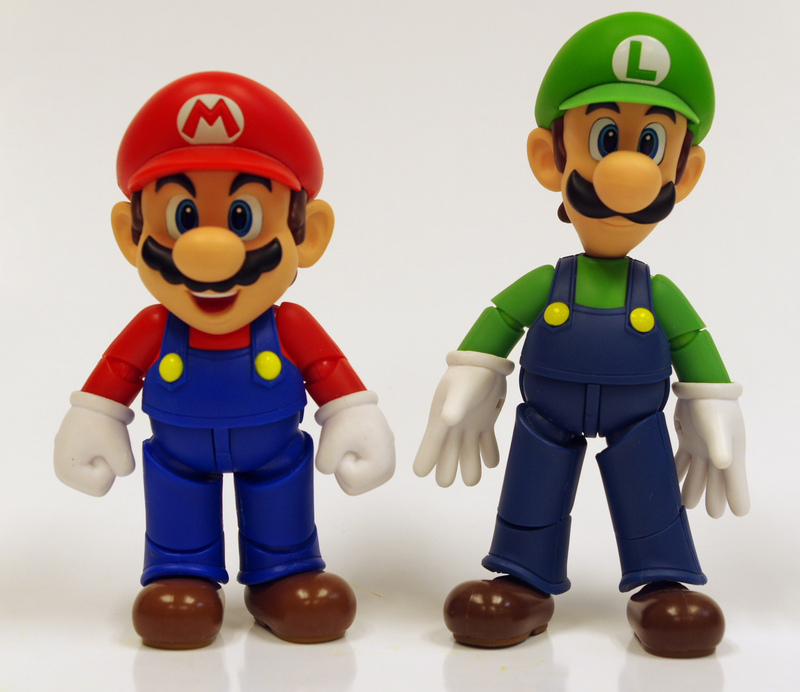 Which is another nice nod to Super Mario Brothers 3, and Super Mario World, the return of Reznor and the Koopa Kids. 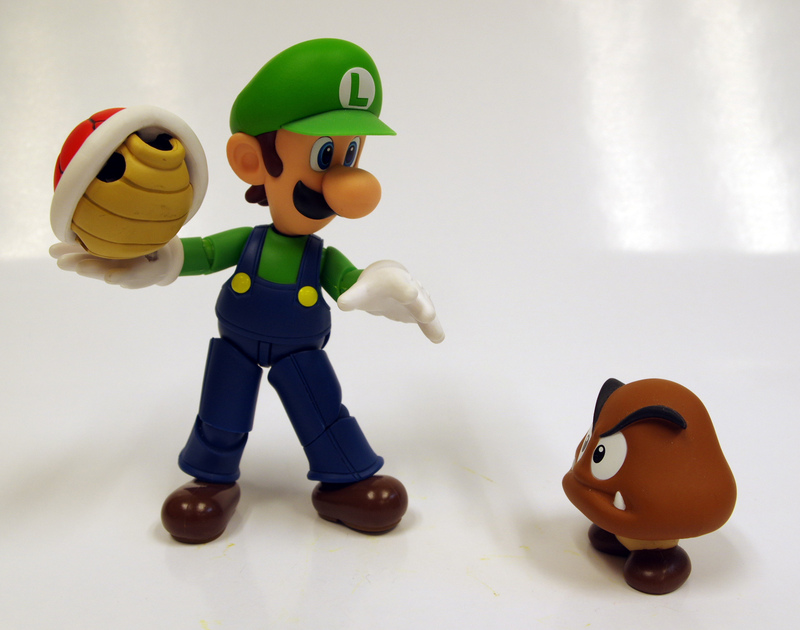 Bowser Junior was the villain of the first New SMB, instead Bowser’s other kids get to take control here, one in each world, just as you’d expect. If you really like the coin mode there’s also the Coin Rush Mode, where you play 3 randomly selected courses with a very limited time set to see how many coins you can gather. 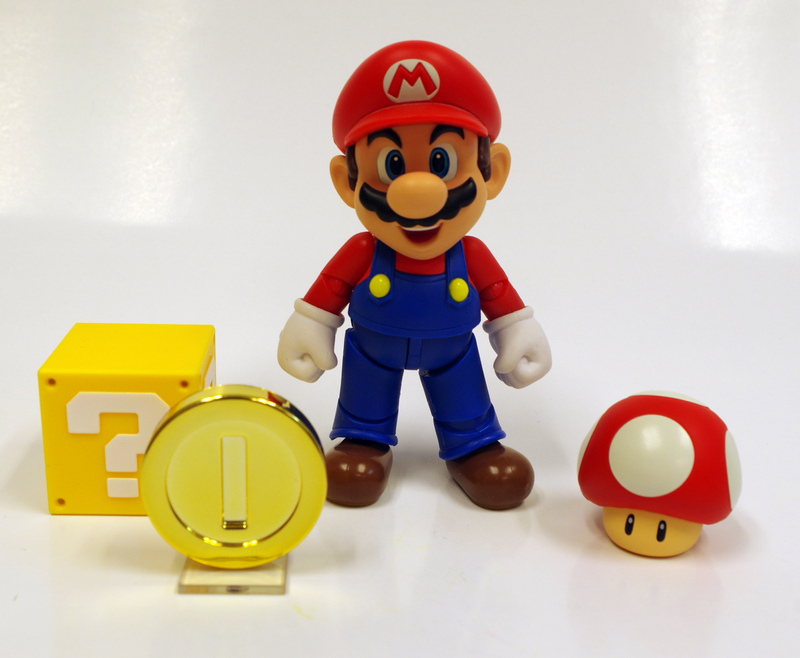 These coin records can be saved and shared via the Street Pass system, to let you try to beat other’s records. It’s an alright additional mode, though nothing special. You can also purchase additional course sets, which I believe is the first time a Mario game has had paid DLC. Honestly, I don’t find the mode fun enough to justify buying more stages for it. I’d rather just buy another title. What’s the final call here? Well, it’s a decidedly adequate Mario Game. It’s fun, it’s got some good references to older titles here and there, it’s everything you’d expect. It’s also… everything you’d expect, with nothing overly new. The Legend of Zelda has kind of a crazy continuity, or more, a crazy lack of continuity. Despite there being many many Zelda title in the series, more or less all about Link fetching the Triforce to save Hyrule, there are few that are direct sequels or even that take place in the same world. Link has had many different designs over the years. Generically, he’s kind of an elf looking person in a green tunic. Sometimes he’s an adult, sometimes he’s a child, sometimes he’s somewhere in between. 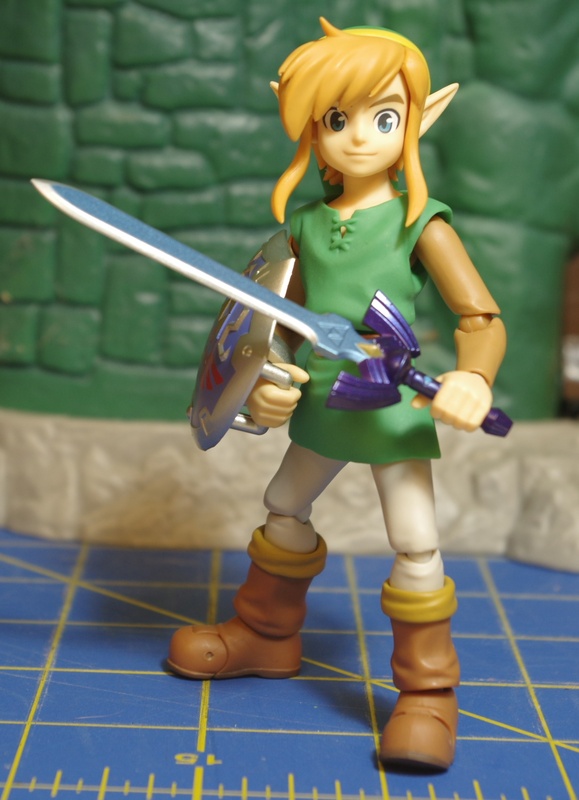 This version of Link is based on his appearance in the game A Link Between Worlds, a 3DS title that is a sequel to the SNES classic, A Link to the Past. 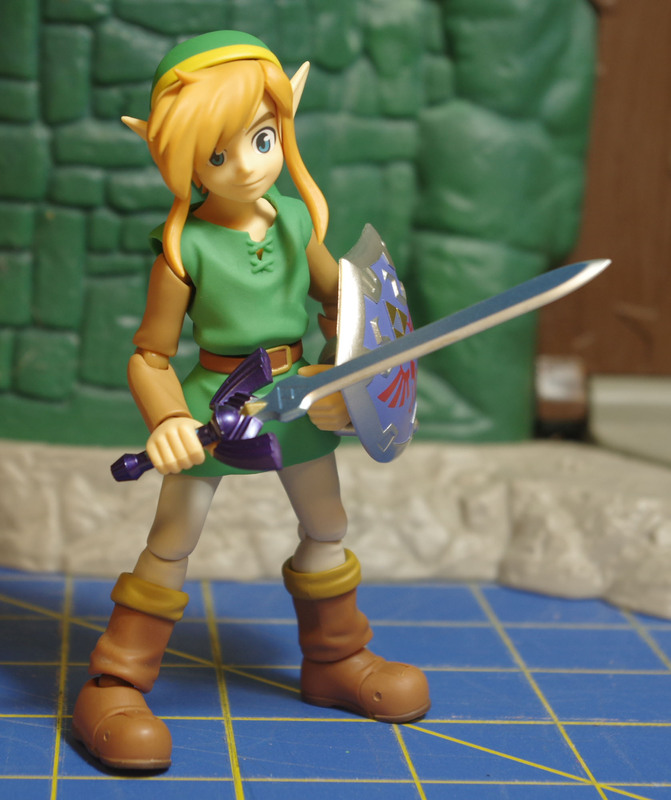 This is the second Figma Link, the first being one of the older designs from Skyward Sword. This design really hits all of the right points for my preferred link. Most of my experience with the Zelda series is in the older games, before Link was a grittier older warrior type like in Skyward Sword or Twilight Princess, and before he became a kooky cartoon caricature like in Wind Waker. It’s not exactly the same as the classic Zelda 1 style art but he’s a lot closer to that design than other options available at this time. It also helps that A link to the Past is probably my favorite Zelda title. If I had any real complaint it’s that he is a really small figure. 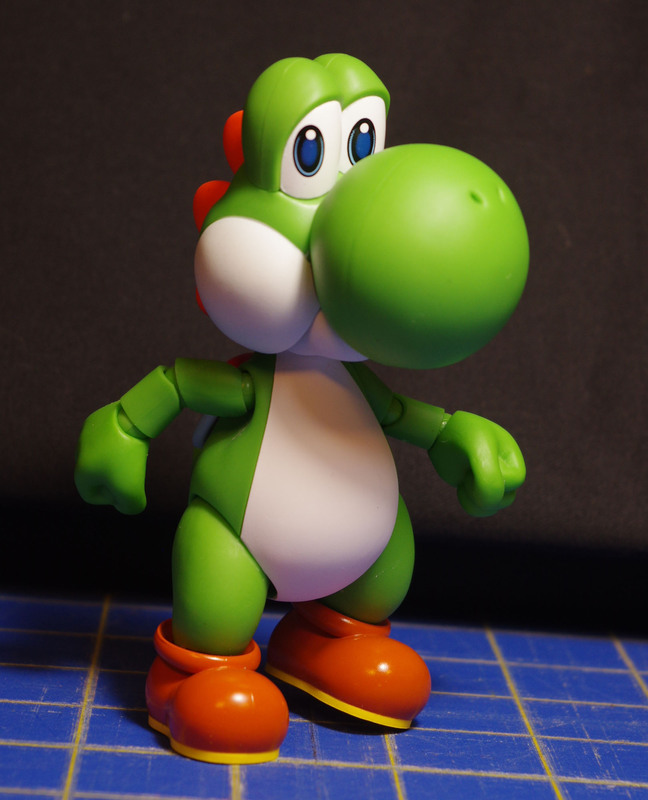 Like 4″ tall short. 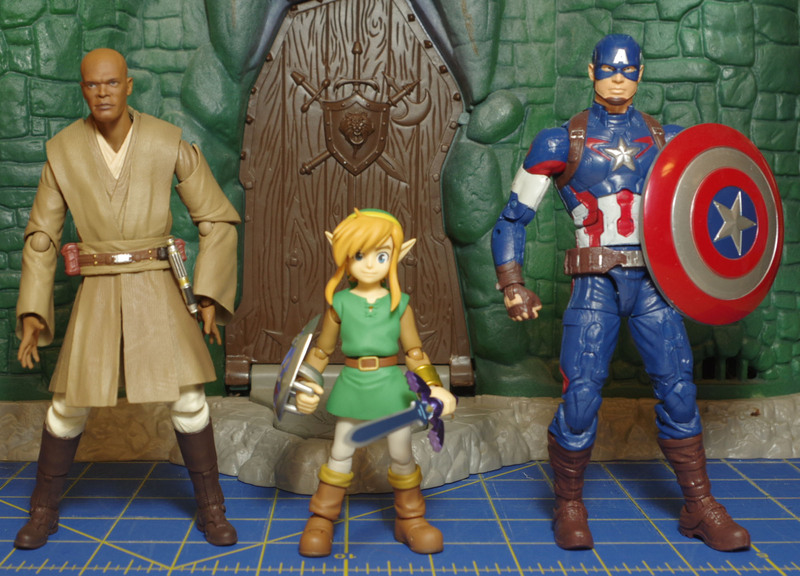 Admittedly this is kind of personal preference, I like to mix up my figures across lines, and I was hoping for a Link that didn’t come off as being a 5 year old kid next to my other ~6″ figures. Personal gripe aside, it’s a fantastic figure to be sure. 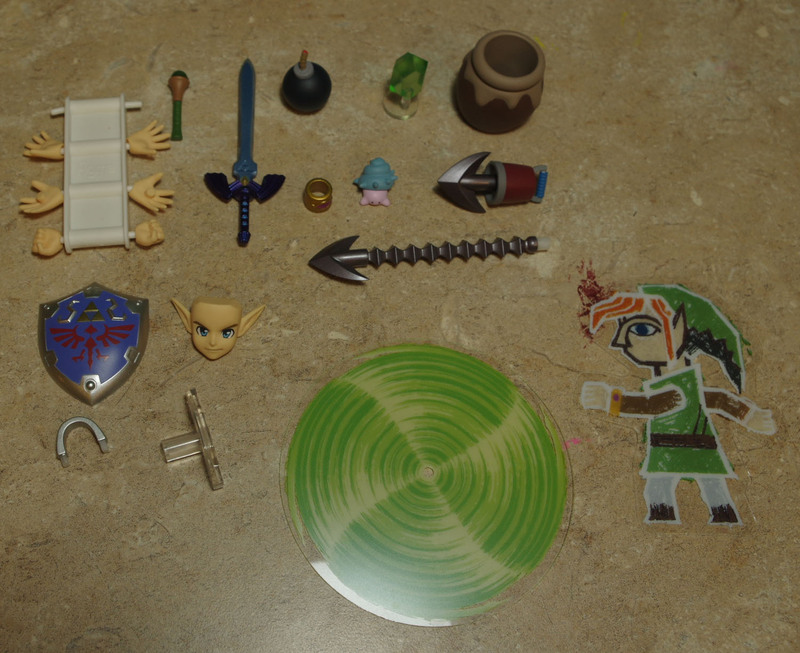 The accessories on the basic Link feel a bit lacking, though there is a DX version that includes a whole slew of extra bits. 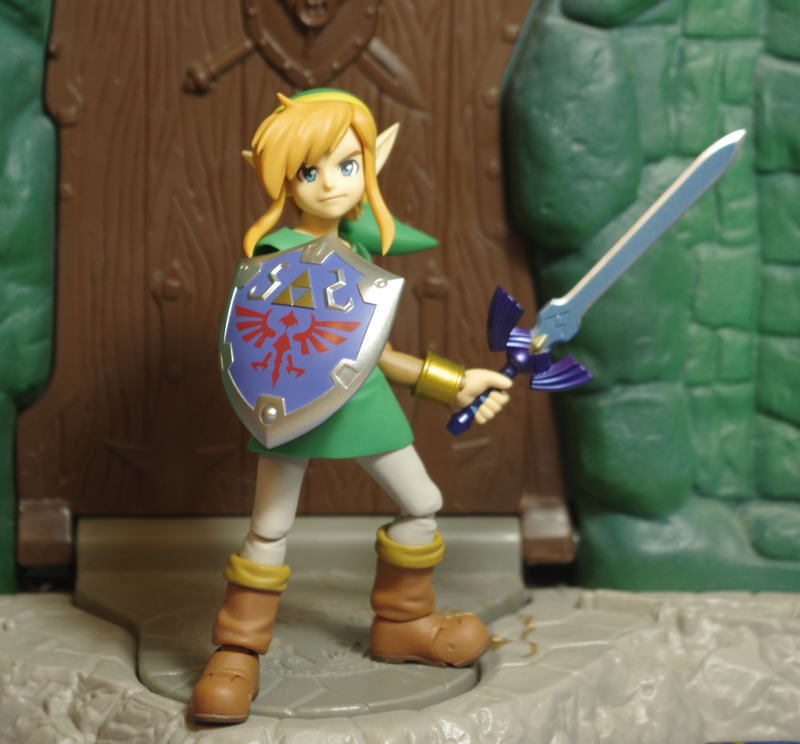 The basic Link includes a stand, two faces (total), the Master Sword and Link’s Shield. 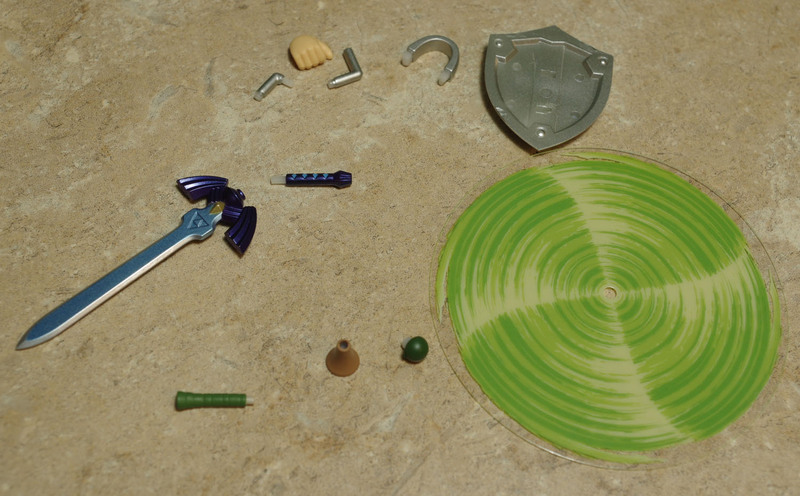 He also includes a flat cut out Link that is part of the gimmick of A link Between World’s gameplay. There are also alternate hands and a bracelet that can be removed if desired. 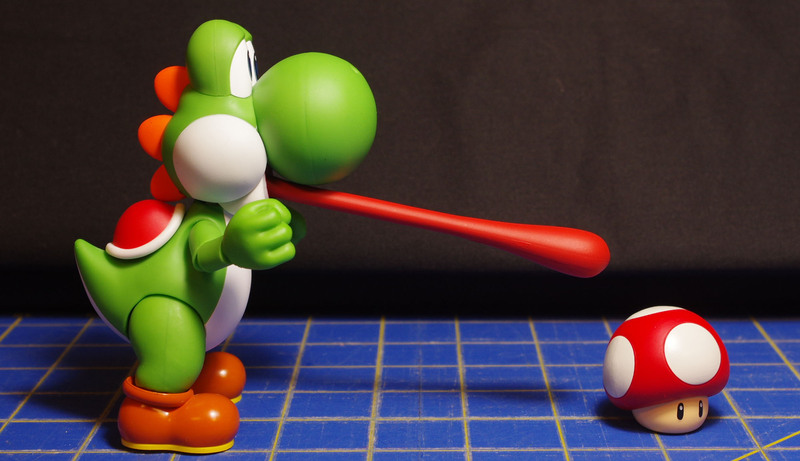 The DX version also includes a Tornado Rod with a flat effect piece, a Hookshot with long and short hooks, a Bomb, a Rupee, a Pot and a Baby Maiamai. All of the accessories are well designed and easily used. There’s a lot of “quality of life” sort of features to these accessories alone. For example, the sword isn’t one piece, forcing you to jam it into his hands, the hilt is removable so it can easily be slid into the hand and reattached. 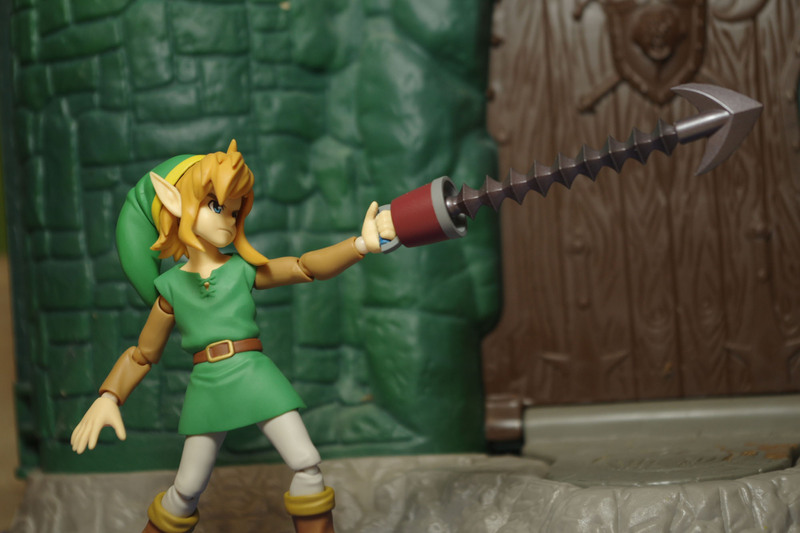 The shield and hook shot handles both disassemble into several pieces to be easily put into Link’s hands as well. The shield can even be adjusted so it can be held in both Link’s left or right hand (since Link is a southpaw except when facing west). 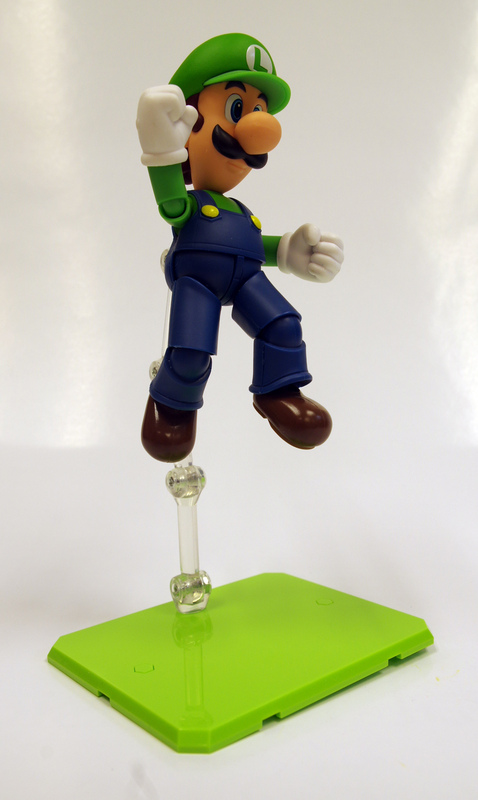 Little touches like this really help sell the figure. Pose ability is nice overall as well. 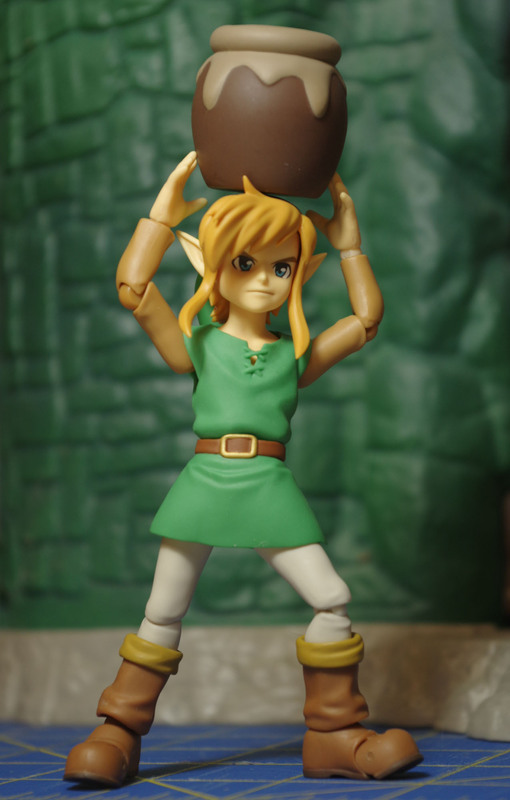 The skirt part of Link’s tunic is a flexible rubber sort of material that allows for free movement in the hips, something that can often be a problem for figures with similar sort of outfits. My only actual complaint with this figure is that his hair and face come off a little too easily. This seems to be somewhat of a Figma problem, since I have similar issues with Figma Motoko. There isn’t quite enough friction to hold things in place solidly. It’s really not a huge problem but it can be a problem. 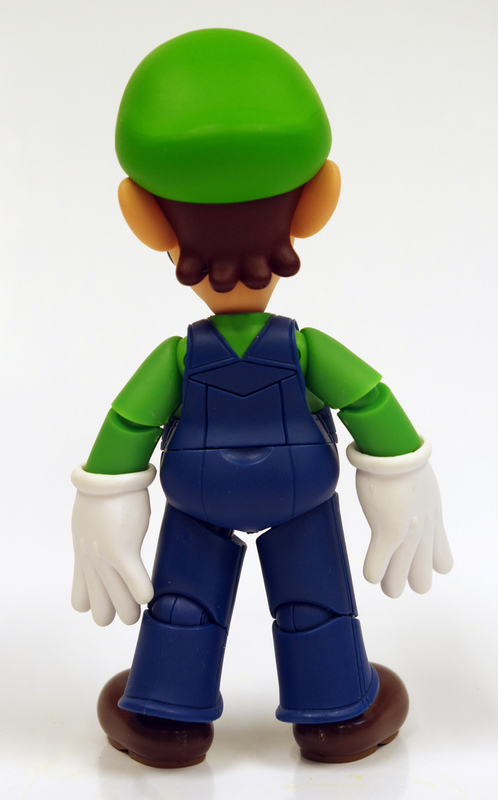 Another “Figma Issue” is that often when swapping the hands, the peg comes out of the wrist instead of the hand coming off the peg, which can make the peg hard to remove from the hand, since it’s so small. This is another issue I’ve had with other Figma as well. 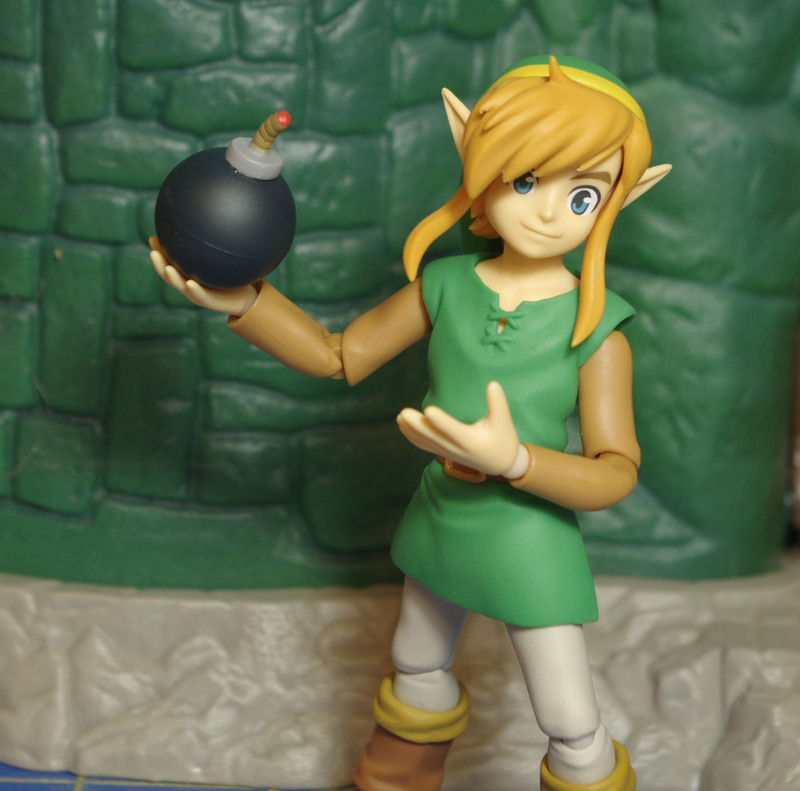 Figma A link Between Worlds link is a pretty good figure. Some of what it comes down to is, which Link Design do you prefer. 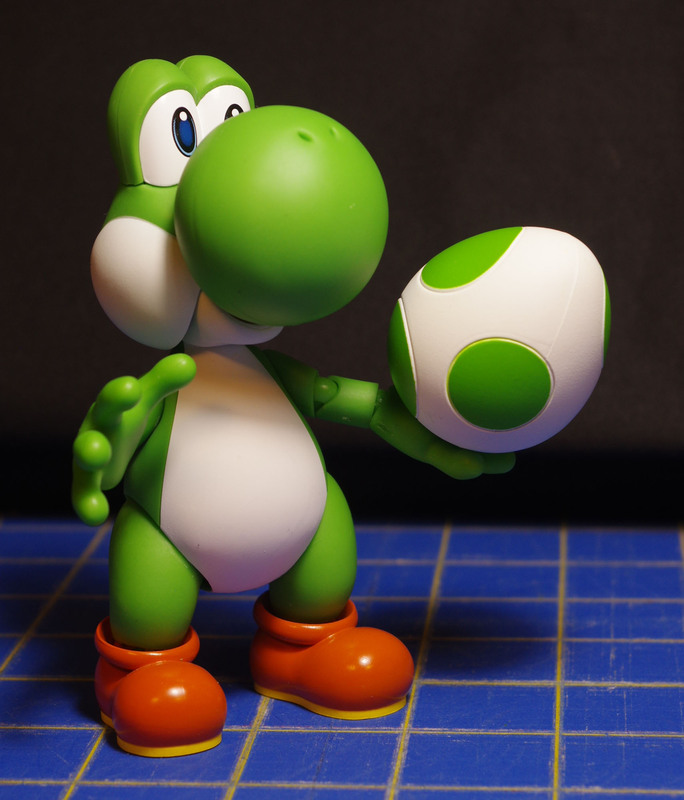 Also, given his small size, he’s a bit pricey, even for an import figure. 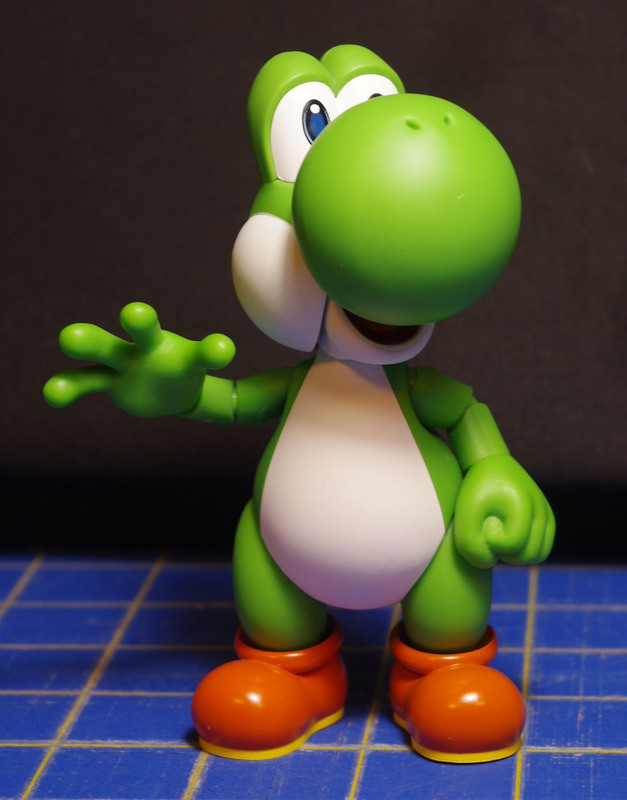 Higher prices aren’t uncommon for import figures but the tiny 4″ size makes that harder to take, especially with the anemic accessory count on the non DX version.